From the network topology, we have a web server that has been assigned a private IP address for security reasons. Our goal is to configure static NAT on the router in such a way that http requests to 192.168.2.1 from host B or any other host on the internet will be redirected to the web server. This will ensure that the IP of the Web server is not advertised to the internet. 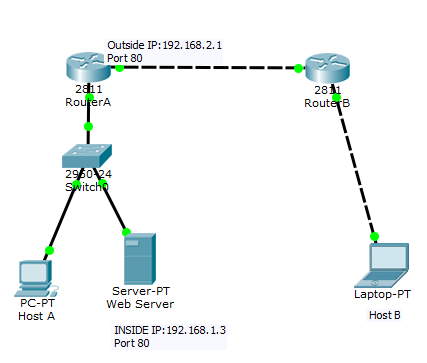 the router) to be redirected to an inside source address, in this case 192.168.1.3. HTTP is a TCP protocol that makes use of port 80. >> Interface f0/1 connects to the LAN and is named inside interface. You may also like: NetworkAddress Translation (NAT) configuration on a Cisco router, from start to finish. This configuration was done, assuming that other basic configurations had been done. For a guide on the complete configuration required on both routers, from start to finish, see the output of show run command on both routers. 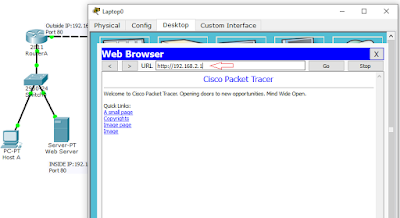 ← Network Address Translation (NAT) configuration on a Cisco router, from start to finish.